Christmas is slowly but steadily getting closer, and PlayFrank is one of many online casinos that are making the waiting time a bit more fun with a special Christmas promotion. Make deposits throughout the month to get your hands on deposit bonuses, bonus spins and more! 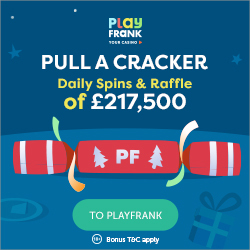 PlayFrank is getting into the Christmas spirit, and they invite you to participate in a month-long casino special called Pull a Cracker. 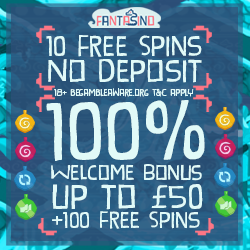 Players who play frequently at PlayFrank are used to being spoiled with great bonus spins offers every week, and during December you can get even more action by logging in and making deposits. When you log in for the first time of the day, you will be presented with a riddle. You need to figure out the answer to this riddle in order to find out which selected slot the daily bonus spins will be on. If you are a veteran slots player you shouldn’t have too hard of a time cracking the puzzles, and we’re sure PlayFrank will give you some good hints along the way. Once you make the first deposit of the day, you will get to pull a cracker that contains 75% reload bonuses, 50 bonus spins or 25 super spins on some of the most popular slots in the casino. A new treat is available every day, so make sure to not miss out on anything! Each cracker also contains a crown. These golden paper crowns work as tickets to the prize draw that takes place at the end of the promotion. The Christmas raffle has a massive prize pot of £17,500 cash, and you can earn as many tickets as you want. You can get extra crowns by levelling up in the bonus tracks or by doing the daily challenges in the casino, so collect more tickets by being active in the casino. When playing at PlayFrank this December you can also participate in NetEnt’s Christmas promotion. Simply play on popular NetEnt slots such as Secrets of Christmas and Jingle Spin to collect tickets into a prize draw. A total of £200,000 is to be handed out during December, with a new big prize pool becoming available every week. There are several great Christmas themed NetEnt slots to choose from, so pick your favourites and get into the Christmas spirit with the added chance of picking up a sweet cash prize as well. Check out the full details and terms and conditions by clicking on the link to PlayFrank.